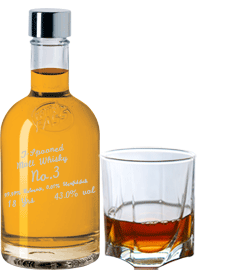 With a teaspoon of single malt whisky from a great distillery, this wonderfully classic-spicy whisky has been refined, making it a particularly sought-after rarity, a T-spooned malt whisky. An exquisite malt whisky with pale golden shiny color. On the nose malty notes with fruit and a slight sweetness, highlighted by earthy notes. Sweet on the palate with oak tones, subtly dry with metallic-salty notes. Medium finish with subtle sweetness underlaid with fruit and with a metallic-fresh finish.